This is probably the only copy of this photo in existence. 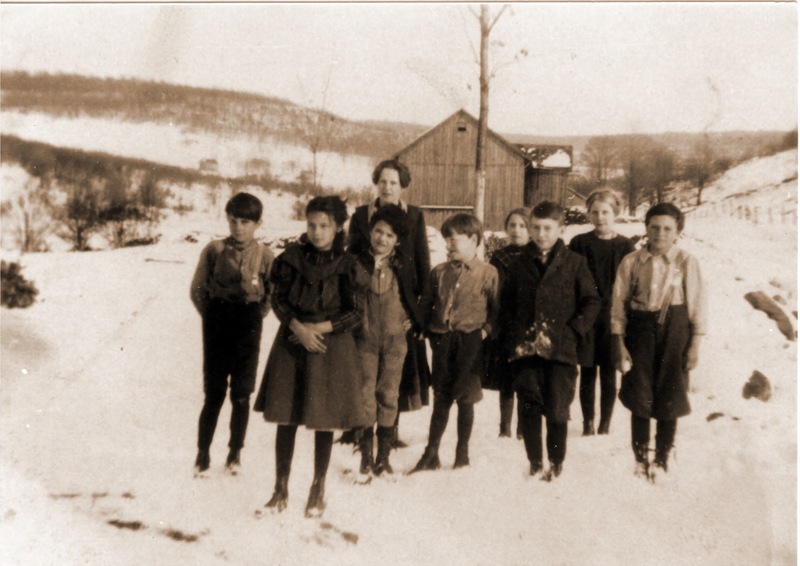 My father Howard Rose, who was born in 1907, is the boy in short pants in the front, and the dark haired boy on the far left is Floyd Rose. The photo was taken around 1914 or 1915 in the school yard. I think this was called the Tray Valley School. The barn in the background was my grandfather Denny Rose's and the house can be glimpsed just beyond, that's how far my father had to walk to school. As I understand it the teachers usually boarded with my grandparents. There were no names on the photo. Pearl Rose Shaver (Mrs. Fred) gave me this photo and named the pupils, she thought the year was 1917-18. Left to Right, Floyd Rose, Clair Gockel, Jay Burton, Howard Rose, Lena Burton, Volney Keator, Jessie Rose, Raymond Gockel, Tall girl in back row is Pearl Rose (Shaver). It was known as the Tray Valley School.